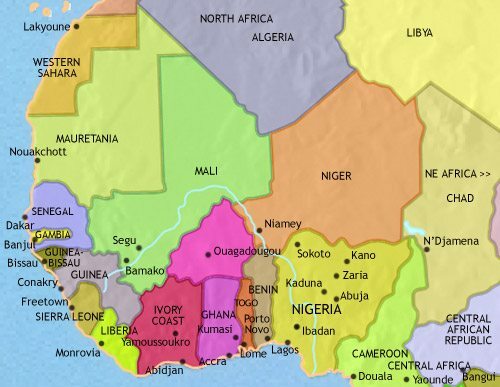 In the mid-11th century a Muslim religious movement, the Almoravids, briefly conquered a large area of the western savannah country, giving the spread of Islam a huge boost and undermining the power of Ghana. The long-distance trade networks are now spreading into the forest region to the south of the savannah. This is stimulating urbanisation: the Yoruba people are forming a network of towns, and the Edo have founded the city of Benin. The bronze and brass sculptures for which this region is justly famous are already being produced. The trans-Saharan trade had become well-established by 200 BCE at the latest. However, it remained small-scale for several centuries, with goods being carried from one oasis to another by different Berber groups. All this changed when camels came into regular use on the route. These large animals are superbly adapted for desert environments, and their use enabled the trans-Saharan trade to expand enormously. This set in train a competition for control of the southern sectors of the trade routes, which in turn stimulated the emergence of large chiefdoms. Importing horses from the north, some chiefs were able to form cavalry forces and so dominate surrounding villages more easily. Kingdoms are in the process of being formed. With the establishment of Muslim power in North Africa, the long-distance trade across the Sahara received a further boost. This stimulated trade within the Saharan and sub-Saharan regions. Large towns appeared, with organized networks of markets. Powerful kingdoms also became established. The most famous of these was the kingdom of Ghana. 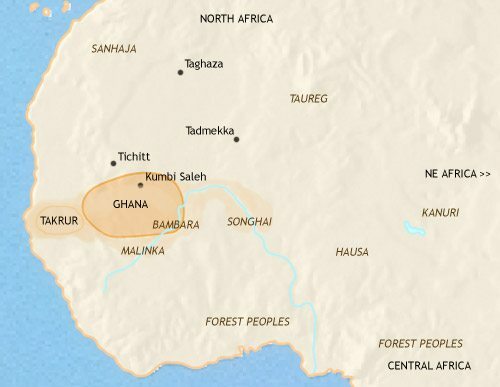 The Soninke people of Ghana acted as middlemen in the gold trade, keeping the source of gold a secret from the Berber traders. Gold was traded for salt (a highly-prized commodity in the region) at king’s capital. 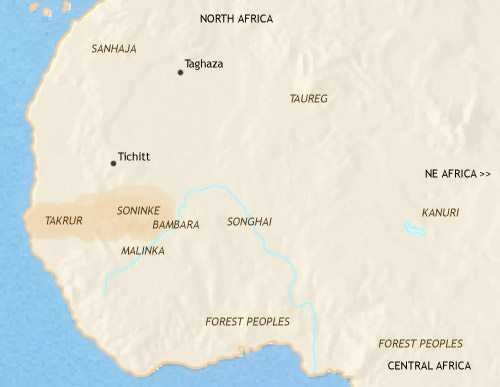 Takrur was another West African kingdom of the period, controlling the southern end of the westerly trade route to Morocco. 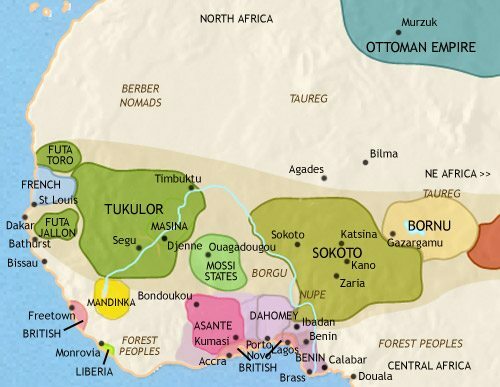 The trans-Saharan trade has continued to expand. 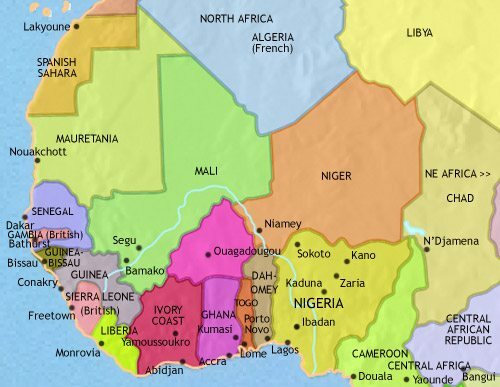 Through them, Islam has been brought to West Africa, and is spreading amongst the merchant and ruling classes. 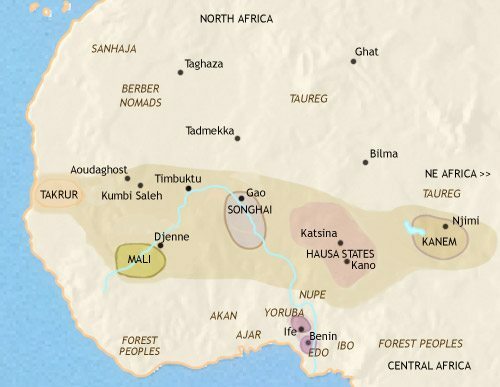 The expansion of trade has led to several new kingdoms being established in the western savannah, including Songhai and Mali. 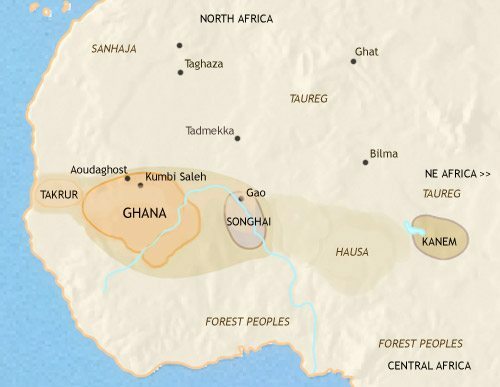 A major new kingdom has also appeared in the central savannah lands, Kanem, on Lake Chad. This is at the southern end of an eastern trans-Saharan trade route which has recently been opened up. 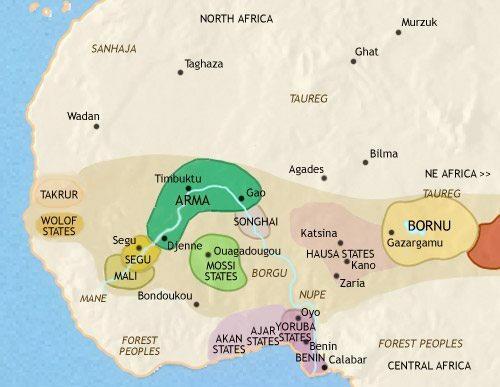 The Hausa trading city-states of present-day northern Nigeria are beginning to emerge, and traders based in the savannah are now penetrating the southern forests. 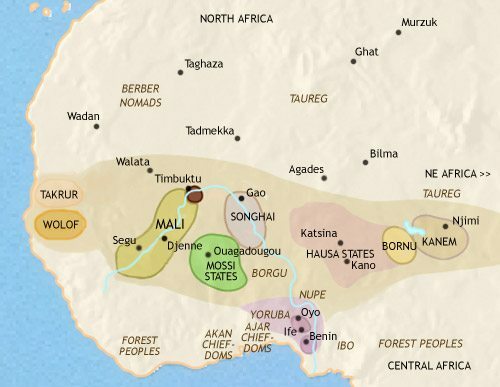 In the 14th and 15th centuries, the kingdom of Mali grew into a large empire, and then declined again. A major upheaval has affected Kanem. Faced with internal revolt and nomadic invasion from the east, a king moved south with his loyal followers and set up a new state in Bornu. Islam has continued to spread. 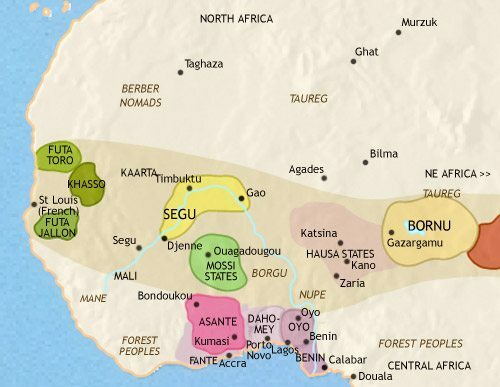 For example, during the 14th century the rulers of the Hausa city-states accepted Islam. The cities of the western savannah lands have become centres of Muslim scholarship. 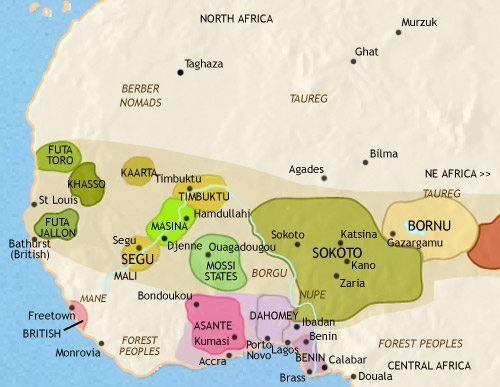 New states have been formed amongst the Mossi people of the northern fringes of the forest region. These have become middlemen in the trade between the savannah and the forest. In the latter, Benin is now a flourishing city, and in Yorubaland, the city of Oyo was founded in 14th century, The West African trading networks have now reached the coast. Songhai was the next West African kingdom to grow into a large empire, but in the late 16th century it was conquered by a Morrocan army from the north. Moroccan soldiers and settlers have since formed the Arma state in the western Savannah. To the east, kingdom of Bornu has gained stability and prosperity. It has reconquered its historic heartland, lost to it in the 15th century. 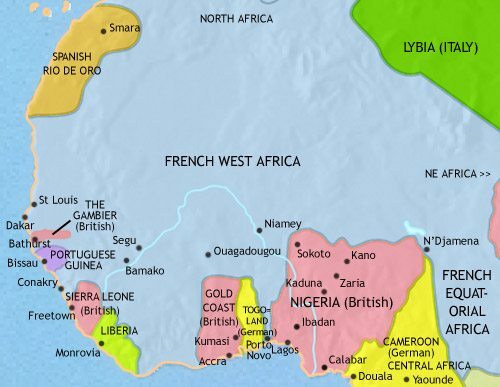 Since the mid-15th century European merchants and sailors who have become increasingly active along the West African coast. The Atlantic Slave trade is by now in full swing, with tens of thousands of captives are taken from the region each year. In return for supplying slaves, the African kings and traders demand metalware, cloth, spirits and guns. Inland, the slave trade is entirely in the hands of local African traders, often operating in large, well-organized enterprises.